Hi there! Welcome to “Director’s Almanac,” where I write about things on my mind, stuff I’m up to, and miscellaneous stuff that has me jazzed at the Institute on the Environment (IonE), the University of Minnesota and elsewhere. Why read it? Maybe because you have time to kill. Maybe because you’re wondering how my mind works. Or maybe you’re just so committed to IonE that you can’t read enough about it. I welcome your feedback. So here we go! The problem is that sacrifice doesn’t work that well, particularly in the United States. Guilt doesn’t either. Instead, people are motivated to make durable change through a sense of striving and legacy, hope of a better future, and substituting harmful behaviors for alternatives that don’t feel much like a sacrifice at all. (For example: The perception that a Tesla is cooler than a gas-guzzling car anyway.) Research also shows the importance of ideology in driving individual opinions about climate change. Most people are looking for a life that’s happy and morally justified: the good life. And if we want sustainability – things like greenhouse gas emission reduction and habitat protection – we are going to have to find ways to align sustainability with the good life. And the good life is not just for Americans. All humans deserve the right to pursue a full life in pursuit of the things that meet their needs and bring them happiness and fulfillment. This points to the biggest, most important challenge of sustainability: aligning pursuit of the good life with sustainable life habits, particularly in rich countries where people consume the most. Until we overcome this challenge, sustainable technologies will not be taken up, environmental policies will not be enacted, and real environmental problems will be ignored until it’s simply too late to do something about them. Many students were surprised to learn how much they valued comfort and convenience and how much their environmental footprint was being driven not by something important to them but by the easy choice. The disposable cup even though they could plan to bring a reusable one, the tolerance for waste in the name of convenience, the autopilot of never even stopping to consider if there’s a sustainable option that could as–or more–pleasant and rewarding (e.g., hopping on the light rail instead of driving). They also found core values with a big environmental footprint that is hard to avoid, such as flying to visit a grandparent. They also discovered that they had a lot of agency over their behaviors and environmental footprint, and they may have even more agency in the future (e.g., opportunities to live close to family or work). At the Institute on the Environment, we help people discover a sustainable good life. Are you on that journey of discovery too? We invite you to join us! I’d love to hear about it; please tweet me what you have learned. In the end, sustainability is from the collection of all our individual choices and actions. What’s one of the most exciting ideas being talked about in Washington right now? You have to dig deep – past the day’s newest Democratic presidential candidate and the soap opera of Michael Cohen – but it’s the Green New Deal (GND). I’m excited about the GND because I’ve dedicated my professional life to understanding the effects of environmental change and working across boundaries and divides to find ways of overcoming environmental problems. The GND is the biggest idea out there right now for making nationwide progress on sustainability. And it’s high time that those of us working on environmental issues get up to speed on the GND — and get engaged. Details of the GND are still emerging, but, at its core, it would invest money from taxes and other federal revenue into civic projects for the common good. It’s the combination of two key ingredients. First, the GND invites us to remember the New Deal of the 1930s and 40s, a period of government investment sparked by the Great Depression, when workers were the immediate beneficiaries of public infrastructure projects. Those public goods are with us still today, in the form of bridges, national parks, universities (including several buildings at the University of Minnesota), police precincts and airports. The New Deal put millions of people to work, supplying a pressing economic need at the household level. Second, the GND would push our economy from a reliance on dirty fossil fuels — which cause climate change — toward a clean and reliable energy system. The GND would stimulate growth in the green economy by investing in assets that have medium- to long-term value, such as community-scale solar energy and grid modernization. Combine incentives for work through public infrastructure projects and a focus on clean tech, and you get the basic idea of the GND. Short of a carbon tax (which hasn’t found favor) and the Clean Power Plan (which addressed only electricity production and the Trump Administration overturned), the GND is one of the first policy ideas to recognize the need for greater sustainability at a national, systemic scale – and it ties directly to economic concerns in a positive way. Several trends suggest that our economy is primed for a transition, if there were a spark to ignite it on a large scale. Renewable energy is now cost effective in many cases, and investing in a smart grid makes sense for its efficiency, reliability, and ability to accommodate new technology, even without thinking about climate. The GND acknowledges that the energy transition must be coordinated and facilitated: it’s a social and economy-wide project that cannot emerge from individual or private actions alone. The GND also seeks to lower the up-front costs of renewable energy and other green assets so that a wide set of society can enjoy its stream of benefits. Advocates for the GND are smart to combine sustainability and employment. It overcomes the false claim that protecting the environment comes at the cost of employment and economic productivity. Under the GND, a roll-out of green infrastructure produces jobs. You see evidence of this possibility in the rapid growth of jobs in the renewable energy sector (e.g., the fastest area of job growth in Minnesota). It also makes economic sense because the impacts of change are large and growing, and avoiding massive future damages and the substantial costs of climate change adaptation are in our national interest. The benefits of the GND can and should flow through private institutions and organizations — capitalism at its best. (And not socialism, by the way, which is government ownership of the means of production and key assets.) The GND also has to be restricted in scope because public resources are limited, but public investment can attract private investment if it’s crafted well. Fortunately, economic research explores how to incentivize private investment and shows that public spending can yield both public and private returns. I do not dispute that a GND could be implemented badly, or that it could be too costly or unrealistic in what it can achieve. There is risk that it could mean different things to different people (and therefore fail to gain political traction), and there’s a legitimate worry about how to pay for it (especially if it is all things for all people). Data suggest that most people have not heard of the GND; yet it appears to have some bipartisan support among those who do. Further, the parallels between the Depression and our the crisis of environmental stress that confronts us today are imperfect. But let’s not throw the baby out with the bathwater. A policy strategy that uses public investment to drive public and private good, in a way that is responsive to a profound environmental threat and helps individual citizens, simply cannot be all bad. During the Depression and today, the government can play a role in stimulating economic productivity for its citizenry. Environmental scholars–and our students!–should engage with the GND because we need great ideas to make and enact good policy. Great ideas is what we peddle, and we can support constructive dialogue around the GND. Let’s shed our anxiety about engaging with policy ideas and get to work helping identify good projects and effective incentives for the GND. There’s plenty of opportunity to craft what the GND can and should be, thereby helping to build a future where people and planet prosper together. Well, it’s official! After months of organizational redesign and an extensive job search, we just announced two new associate directors. I’m extremely excited to begin working with Melissa Kenney (Associate Director for Knowledge Initiatives) and Cathy Jordan (Associate Director for Leadership and Education). They’ll join our third AD, Todd Reubold, who is leading our newly-formed J-Lab (“j” is for “journalism”). I’m thrilled with the outcome of these searches and humbled by the expertise and experience these women bring to our organization. I dedicated several blog posts last year to repositioning and strengthening IonE. As we turn the corner to 2019, however, I’m going to turn my blogging attention back to sustainability science and to ideas arising from my research and experiences as a sustainability leader. As we say in IonE’s new strategic plan, we must fill critical knowledge gaps to make progress on building a future where people and planet prosper together. So back to the research bench I go, sharing this month two findings, published already this year, that reveal how to reduce greenhouse gas emissions and grow adaptation around the world and in the Midwest. 1) It is incorrect to assume that countries need to grow emissions in order to make gains in climate change adaptation. Martina Grecequet, Eri Saikawa and I recently conducted some analyses that compared trends in greenhouse gas emissions with trends in the ability to adapt to climate change, for hundreds of countries around the world. It’s a common assumption in international development that countries have to grow their economy (with greenhouse gas emissions) to build up assets and capacities that defend against the impacts of climate change. Some have even argued that it is unethical to deprive developing countries of economic development from fossil fuels, because they need that economic growth to face climate threats and climate-related disasters. Our analysis, however, that draws on global emissions data and a global adaptation index, shows 42 (23%) countries around the world are bucking that assumption–these are countries that are decreasing their emissions while also increasing their adaptation to climate change. As a group, they are responsible for 26% of global greenhouse gas emissions. This group includes countries that are increasing the use of renewable energy (e.g., countries in the EU such as Belgium and France) and also less developed countries including Gabon and Nigeria. If we are going to hold global emissions below 2 degrees C of warming (as the Paris Agreement aims to do), we will need to find new paths of economic development, and our paper suggests new ways are beginning to emerge. This is a hopeful pattern that needs to be rapidly spread around the world. If all five of the mechanisms were applied in the U.S. Midwest – and beneficial farm practices adopted as a result – we estimated that fertilizer run-off to the Mississippi River would be reduced by 25 percent. And it would fight climate change on par with closing a bunch of coal plants, a well-understood source of greenhouse gas emissions. Adopting these mechanisms is feasible, though not easy to do politically. Knowing how much of a difference it would make is a step toward building political will. In both of these new studies, we examine not how to do sustainability—specifying sustainability technologies or techniques—but how much those strategies are needed and what difference they can make. Working toward sustainability can be daunting, but this research is critical to strive toward a future where people and planet prosper and measuring our progress in getting there. Now that 2018 has come to close, it’s possible to look back on the extraordinary achievements of IonE and our community members over the past year. Only one thing to say: wow! There’s a lot about directing an institute that’s visible to the outside world, and the public parts of my job are fun and exciting. But there’s a lot that I do that isn’t public at all, work that goes on behind the scenes. This work is just a important as the loud and visible part: It’s about building relationships and recruiting partners to our institute’s mission, sometimes one partner at a time. Earlier this month the public and private collided, because I got to share with our community, our partners, and friends, along with the rest of the world, something I’ve been working on for a long time — a new partnership with Ecolab. The Ecolab Foundation granted $5 million to the University of Minnesota, and all of it to sustainability. This gift brings new resources and opportunity to Institute on the Environment’s mission and work – and it is the single-largest gift the Ecolab Foundation has ever made to the University. Over the next six years, the Ecolab gift will make environmental education and immersive learning experiences more accessible and affordable for diverse and talented undergraduates from across the University. It will support dozens of these Ecolab Scholars who will pursue degrees in sustainability fields and have unique experiences learning about sustainability first hand, in study abroad, real-world projects and internships. And the gift endows the first chair of the Institute on the Environment. An endowment provides resources to IonE every year in perpetuity, providing new funds that we can direct to strategic initiatives (such as our new Impact Goals! ), growing our impact and staying on the cutting edge of engaged, interdisciplinary scholarship. The chair will be valuable in recruiting future leaders of IonE too. I’m the leader today, but I won’t always be. We must plan for a healthy institute in the long-term, and I’m grateful that Ecolab is helping us do that. That IonE could play an essential role in bringing this gift to the University — and is a primary beneficiary — is a testament to the work we do at IonE and how we do it. Through this gift, Ecolab endorsed the profound need for new ideas and new leaders to address sustainability challenges, and it recognized that the best ideas come from people working across fields and ways of knowing, building a future that is better than the one we have today. This gift also signals the Ecolab Foundation’s recognition that the University of Minnesota is *the* place to make substantial, impactful strides in sustainability. Not only does Minnesota have unique assets including IonE (one of the first university-wide environmental institutes in the country), but also our university serves a state where innovation and independent-thinking dominate — a place that has inspired others and transformed the globe before. Ecolab knows that we are the people who can make sustainability happen — and are already. Earlier this month, we spent a morning celebrating this gift and the partnership it implies. It was inspiring to see our building’s atrium filled with people who share a drive to change the world. Even Goldy Gopher joined us. Of course, Ecolab is not the only behind-the-scenes thing that’s happened this year. We made a bunch of organizational adjustments at IonE this year, to leverage our role within the University and the state, serve our growing community, and increase our real-world reach and impact. Our new organizational design focuses on and incentivizes the pursuit of cutting-edge research that brings diverse people together to move the needle on sustainability; the creation of human capital with the knowledge and leadership skills needed to put sustainability into practice; and the production of storytelling that informs and inspires the public while experimenting with storytelling itself. And we are in the process of hiring two new associate directors, who will bring new life and capability to IonE in 2019. While I feel pride that IonE is headed in a good direction (as an advisor and friend of mine recently said: “I like where we are, but I love where are going”), I know that the world around us is filled with environmental injustices and conflict over basic scientific facts. It’s hard to read the paper some days. I believe 2018 will go down in history as a particularly tumultuous one, when we went backward (nationally at least) on environmental issues that affect lives and livelihoods. P.S. Let’s start 2019 off right by adopting five financial incentives to revive the Gulf of Mexico dead zone and Mississippi basin soils, a new paper emerging from our Wicked Econ program — lock scientists and economists in a room with a problem and see what they come up. The program is collaborative with the Nature Conservancy and our paper was just published in the Journal of Environmental Management. More than a decade ago, Tim Pawlenty, at the time Minnesota’s Republic governor, joined with neighboring governors to sign the Midwest Greenhouse Gas Accord, an ambitious plan to transform the equivalent of the seventh largest carbon economy in the world. With turnover in nationwide governorships this year, perhaps that structure will be open for conversation again. While many American politicians are committed to reducing taxes, they’ll also need to financing changing infrastructure under a warmer climate. (Think of the pipes and green space necessary to handle increased storm water and the demand for irrigation under drought.) If funds don’t come from taxpayers, we’ll need creative ways of generating and attracting private investment. Not all local political are rosy, of course, with obvious sustainability opportunities. Many still do not see the connection between jobs, the economy, and health care to environmental change. And we have failed to act on issues like climate change while knowing quite well that catastrophe is coming. But after this election season, I’ll still be doing the work I do as the leader of an mission-driven learning organization. Action — wherever it occurs across the political spectrum — grows from public will, and public will grows from awareness and engagement, from new knowledge and novel insights that help us see what’s possible. On September 28, IonE hosted its second annual meeting, the one time per year where the entire IonE community gets together to share ideas, inspire one other, and strategize. More than 150 people attended who are part of or connected to the Institute on the Environment. What brings us together is the mission of a future where people and planet prosper together – and a common desire to use our university expertise to do what we can, in an interdisciplinary way, to change the trajectory of the world. This year I shared some important news that builds off last year’s annual meeting – news that bears repeating here. At last year’s meeting, many in our community asked: What can IonE do to help us operate not just as individuals but also as a collective force? There was a resounding sense that collective impact could become core to what IonE is and how it serves its community. To all of our current and future community members, I want to say: We heard you. Knowledge initiatives, a home for work that fills those essential knowledge gaps needed to build a future where people and planet prosper together. Leadership and education, to create and support leaders with the soft skills and sustainability chops to put knowledge into practice including students and affiliates, but also legislators, community organizers and corporate executives. J-Lab, a “laboratory” that will produce world-class storytelling about both knowledge and leaders, with reference to journalism and its duty to serve the public good. Organizing IonE around these core capabilities will help clarify the unique role we play in advancing sustainability in Minnesota and the world. Going forward, IonE will have three new associate directors, each of whom champions a core capability while also building and strengthening IonE as a whole. At this year’s meeting, we also shared a new approach to our work that we’re calling IonE Impact Goals. Impact goals are specific outcomes that IonE will support and that we will work on together over a three to five year period. Our first set of goals – in the areas of carbon neutrality, safe drinking water, and sustainable land use – resonate with many members of the IonE community, as we discovered through many focus groups this past year. At the meeting, we heard from our new IonE goal leads (Ellen Anderson, Kate Brauman, and Eric Lonsdorf) and began the process of co-creating the goals in our afternoon breakouts. It is my sincerest hope that everyone in the IonE community can find a way to connect with one or more goals, whether in a large way or in small ones – getting in on the collective action. There are few things that energize me more than smart and committed people brainstorming and strategizing together. I love living the life of the mind and believe we have a duty to use that mind power for positive social change – for the benefit of all. In the afternoon breakout groups, I was moved to see academics at the height of their careers intently listening to the perspectives of student attendees who are just beginning their own careers. Another thing I love about the annual meeting is the many different ways of knowing and doing that are represented. At one breakout table, I found a group composed of an artist, two hydrologists, an ecologist, and an economist. Nothing can stop that combination of scholarship. All of the ideas shared in the breakout groups will be collated by the Impact Goal leads and communicated back to the IonE community. We will use that information to refine the goals and identify subgoals, and we will create research, education, and action teams around those subgoals. My wish for the annual meetings is that they hold us together from year to year, so that ideas raised in one meeting sustain and propel us forward until we meet again. I’m already looking forward to meeting number three in September 2019. Most people think of spring as a time of renewal and rebirth. But if you’re an academic, that feeling is reserved for fall. It’s fall when the students come back to campus and when we begin teaching and mentoring a new crop of young and inquisitive learners. It’s also when the Institute on the Environment opens its doors to more than 6,000 incoming undergraduates — a chance for new “gophers” to see firsthand the experiences they can have at the University of Minnesota that relate to the environment. This year’s SustAction! Day (below) was inspiring and happily exhausting. Seemingly each year more than the one before, students are expressing an interest in sustainability, both personally and academically. It’s not that the summer isn’t busy, of course. It’s a common misperception that academics spend their summers frolicking in the warm weather, free of obligations. 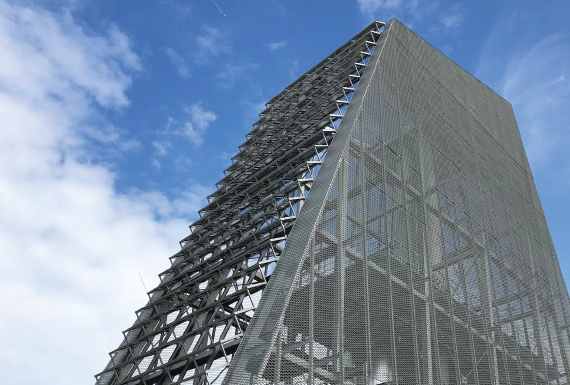 IonE took on a particularly ambitious project this summer — albeit structural. We have been working through an organizational redesign, a re-envisioning of our services and programs to better facilitate team scholarship, more clearly articulate our core capabilities, and increase our efficiency. Soon we will welcome new leaders to IonE in the form of three new Associate Directors who will lead three new programmatic groups: knowledge (filling essential knowledge gaps needed to move the needle on sustainability), leadership (building future leaders to put sustainability in practice) and a journalism lab (telling the stories society needs to inspire sustainability action). Searches for two of these positions will begin soon, and a committee including members of our Faculty Leadership Council, students, and IonE staff has been formed to guide that process. But as the fall arrives, a natural focus on leadership and education emerges each year because students are a major target for IonE leadership development. We reach students through courses such as GCC 3005, Global Venture Design (our own Fred Rose, with IonE Fellows Steve Kelly and Tom Fisher) and my new class (with IonE Fellow Dan Phillipon), GCC 3025, Leading the Good Life at the End of the World. We touch students through the university-wide Sustainability Studies minor as well as our Acara program, a leadership incubator for students from any discipline who want to solve real-world challenges (which is hosting its annual open house on Monday, September 24). And we already started the semester’s offering of programming for graduate students, to prepare them for diverse careers in sustainability inside the academy and out. We do know that sustainability leadership is much more than understanding key principles – how carbon cycles around the globe or how nutrients flow off agricultural fields. It’s also about soft skills – an ability to collaborate, work across differences and divides, and persuade others with good data and compelling narrative. Leadership is about self-discovery and a willingness to take risks in service to a greater good. And it’s a lifelong pursuit, not just for students but also for faculty, nonprofit and government leaders, executives, and other decision-makers who confront environment and sustainability challenges professionally. That’s why we direct leadership programming to these audiences too. Each of us needs to continually grow as a leader so that we can reach our full potential – and to grow, we must practice. I know that leadership is needed to steer IonE through its redesign, so this summer I sought out the wisdom of others leading impactful organizations, including people on our own External Advisory Board. I know that leadership is needed to make IonE a more diverse and welcoming place, and that’s why I took a course this summer on institutional racism. And I know that IonE itself can be an academic leader in creating a new kind of university, and that’s why I’m especially excited about a new grant from the National Academies to scale interdisciplinary research. For the like-minded people who choose to associate with IonE – as employees, students, affiliates, and friends – our institute has to show leadership of its own. We must continue to push boundaries, create new ways of working at the overlap of disciplines and sectors, and hone our focus on impact. This is IonE’s role in the university and the broader world – and it’s what will keep that fall cycle of change-makers coming. P.S. While we’re talking fall… it’s also the time of year when we invite a new class of affiliates to join the IonE community. (If you’re interested, don’t delay: The deadline is Monday, September 17!) It’s also the time of year when we gather our students, staff, affiliates, partners, and friends at the IonE Annual Meeting (Friday, September 28). There’s still time to RSVP for that, too. The Annual Meeting is when hundreds of like-minded people come together to interact and rejuvenate their commitment to helping create a future where people and planet prosper together. The Institute on the Environment (IonE) is dedicated to bringing about a future where people and planet prosper together. (Is it possible for me to say that too many times?!) And one essential element of a sustainable future is clean, renewable, and reliable energy — energy that is affordable for everyone and brings new opportunities for economic development and human thriving. 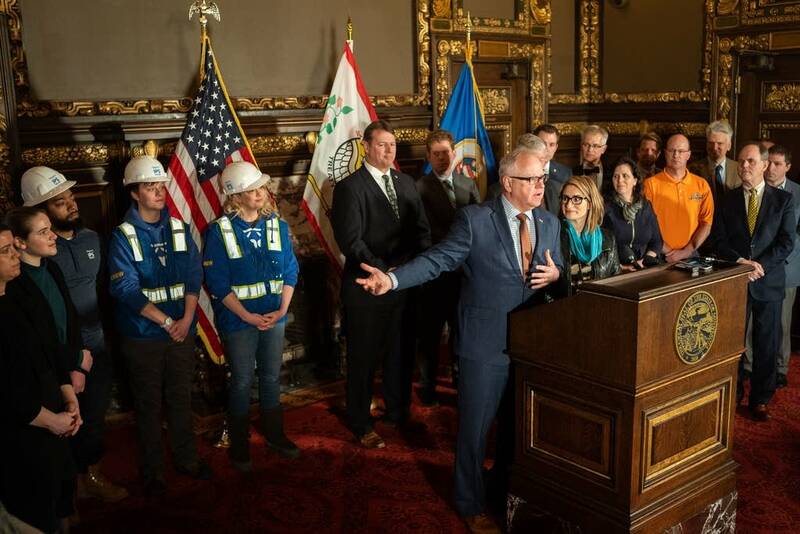 In Minnesota, we are already leading the nation in the renewables revolution, thanks to forward-looking electric utilities, an ambitious state renewable energy standard, and abundant renewable resources such as wind. But another key ingredient to the clean energy economy — one that cannot be overlooked — is people. People who will do the testing, coalition-building, and deployment of new technologies and new business models. Because decarbonizing the economy is not an easy task. Energy leaders will need knowledge and expertise; they will need to be nimble and creative, both technologically and economically; and they will need to work collaboratively, across disciplines, sectors, and communities. We work to build these people — inside and outside the university — at IonE. All of this background leads me to the subject of this month’s blog: an IonE travelogue from one of the world’s top renewable energy producers, Germany. This month I offer a postcard from the future, a future you can find today just a plane ride away. 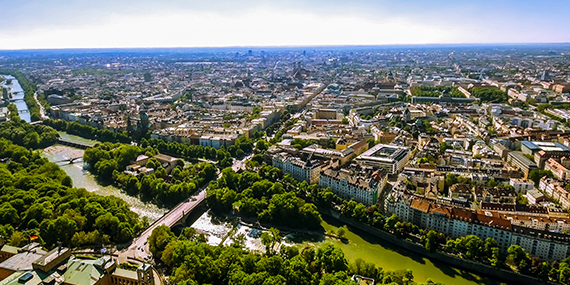 IonE has a grant from the German government to support education, outreach, and renewable energy demonstration projects, and this grant supports bringing a delegation of Minnesotans to Germany to experience the energiewende (or energy transition) firsthand. The grant and its associated program are run by our own Sabine Engle. The United States pales in comparison to Germany and many other parts of Europe in renewable energy production and reinvention of the energy economy. For nearly two decades, Germany has been committed to transforming its economy, building out gigawatts of new, clean electricity, while also advancing energy efficiency of buildings and rolling out “e-mobility,” in the form of electric vehicles, rail, car sharing, and commuter biking. Why are they doing this? To shut down their nuclear power plants — a social imperative arising from Fukushima — and to substantially reduce their greenhouse gas emissions. This German energy revolution hasn’t been without some bumps along the way, but the energiewende has allowed the country to stay in front of the international technology race. Here in the United States, we owe a debt of gratitude to Germany because its government-backed incentive programs created a new, countrywide market for renewable technologies. And this rapidly increased the supply of new, cost-effective technology for the rest of the world. That we can build wind and solar electricity generation in the U.S. for the same — or even lower — cost than coal or natural gas plants is thanks, in part, because of the German people, their ambitious green energy plans, and the early-adopter costs that they incurred. Our 18-person delegation started our adventures in Munich, the economic and political capital of Bavaria, a German state near the border with Austria. Bavaria is one of the most conservative parts of Germany, a region with strong religious beliefs and rising nationalistic and anti-immigration sentiment. Yet Bavarians strongly support renewable energy with wide endorsement for energy transition among their conservative politicians. There we visited with the state government and met with MunichRE, one of the world’s largest reinsurance corporations. The reinsurance industry — if you are not familiar with the term — insures primary insurers, and in so-doing, provides financial backing for thing such as clean energy assets and renewable development projects. MunichRE is also on the front lines of confronting global financial risks caused by climate change. 2017 was the most expensive year MunichRE has ever experienced, with growing insurance claims from extreme weather around the world. 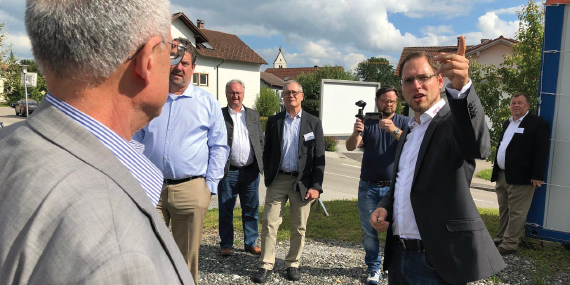 We also visited a small Bavarian town called Wildpoldsreid, which reinvented itself with renewable energy, making money for its farmers and small businesses and financing capital projects such as a new kindergarten. Wildpoldsreid’s transformation all started with eight wind turbines in the 1990s and now includes a biogas plant and a community microgrid that supports electric vehicles, rooftop solar, and battery storage. Here and across Germany, electric reliability consistently beats the United States with fewer than 12 hours of outage on average per year. Ensuring that reliability despite the intermittency of renewable energy sources like wind and solar has been a challenge that the Germans have proven can be overcome. Above, Thomas Eberl (eGRID) explains how batteries connect to the Wildpoldsreid residential microgrid, while Mos Kaveh (Dean, UMN College of Science and Engineering), Senator John Jasinski (MN District 24), Rolf Weberg (UMN Natural Resources Research Institute), and Greg Ridderbusch (CEO Connexus Energy) look on. In the outskirts of Munich, we also visited a municipal geothermal plant (above) that supplies heat to businesses and homes and generates electricity. One of the major challenges to overcome in building a renewable energy future in cold climates like Germany and Minnesota is carbon-free home heating. Southern Germany is blessed with hot water deep underground that is naturally 160 degrees Fahrenheit, and they have found ways to tap this renewable resource at a large scale. From Bavaria, we hopped on a high speed train powered by electricity, whipping through the German countryside — riddled with solar panels and wind turbines — toward Berlin. 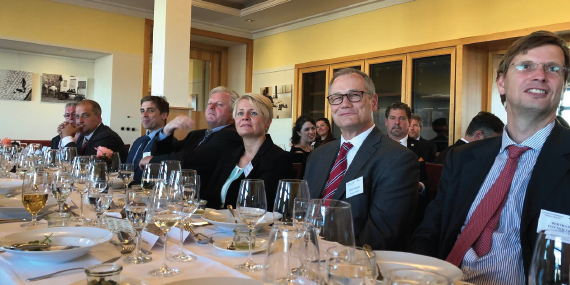 Our first stop in the capital city was the German Foreign Office, where the Bunderstag (German parliament) hosted a dinner of our Minnesota delegation and German guests. This year’s seminar focused on the benefits of renewable energy for rural economies, so during our time in Berlin we also took a day trip to a farming community near the Poland border. This photo shows the delegation at a dairy farm that pumps its cow manure to a biogas digester that feeds electricity on to the grid, generating income for the farmer each month. That day ended at the home of a friend and colleague of IonE, Gerard Reid. The co-founder of Alexa Capital, which specializes in the energy sector, Reid invited local business owners to join us for dinner, where Connexus Energy CEO Greg Ridderbusch had a chance to talk about his solar and storage projects in the north Metro of Minnesota. 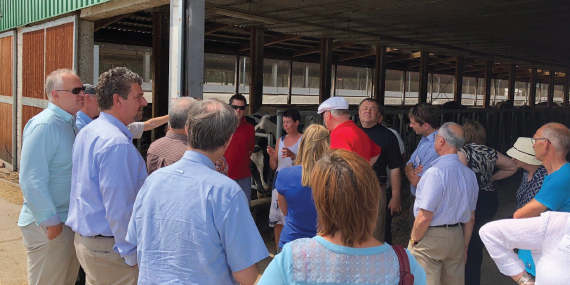 Above, you can see Greg sharing his insights, while the locals and our Minnesota delegates look on, including the former public utilities commissioner, Beverly Heydinger, state Senators Julie Rosen and David Senjem, and the commissioner of agriculture, Dave Fredrickson. We had a full schedule, visiting dozens of agencies and sites, but we had some time for fun too. 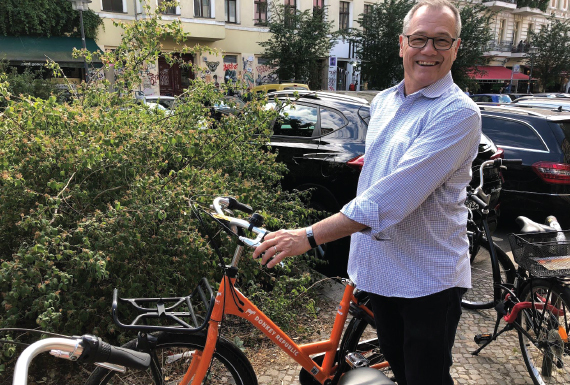 Here the NRRI’s Rolf Weberg shows off the rented bike that he used to tour Berlin one afternoon. An app on your phone allows you to find a bike, rent it and return it. The perfect way to get from point A to point B on a beautiful afternoon in a carbon-free way – a perfect ending note for another successful exchange with Germany. 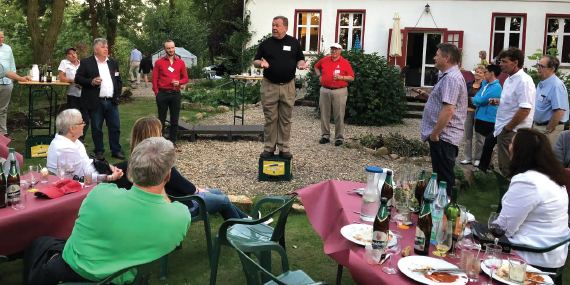 Part of what is special about this program is the extraordinary access our delegates have to German decision-makers – and the remarkably frank assessment these leaders share about Germany’s successes and failures. We also shared with them aspects of energy transition that are working in Minnesota – including a robust electrical grid that can move electrons generated from renewable sources to a wide area and aggressive closure of greenhouse gas-polluting coal plants. By sharing ideas and experiences across countries, we build relationships to support one another on the journey toward a clean energy future. Earlier this year, as an outcome of the 2017 IonE Annual Meeting, we launched some focus groups to ask a quietly provocative question: Would members of the IonE community be interested in working together to achieve particular sustainability goals, and, if so, which ones? About 60 conversations later, involving faculty, staff, and students, the answer seems to be “yes.” Now we are working to refine a set of initial goals into specific outcomes that are both needed around the world and that can come alive in our region. We are striving to roll out these new IonE Goals, and metrics to track them, at our next annual meeting in September. Over the next three years, we will organize around the goals and form teams of university scholars and non-university partners to make progress on them. Why do I say our question is “quietly provocative?” Whether you agree or disagree with this characterization probably depends on where you’re reading from. Out in the broader world, the idea of organizing efforts and aligning resources to achieve tangible outcomes is not particularly radical. But it is not how research universities traditionally work. We’re in the knowledge business, and we tend to divide our business among disciplines and departments. We do have profound capacity to explore, discover, and create, but, historically, we’ve carried out those activities for their inherent value in a rather uncoordinated way. Universities have made immense strides in how they conduct research and discovery, no doubt. Today there is widespread recognition that the modern university, comprised of departments and deep specializations, inadvertently created siloed perspectives that limited the ability of scholars to work on complex and interconnected issues in the wider world. To overcome that shortcoming of disciplinary siloing, several U.S. universities have built formal programs to build and support teams of researchers that span multiple disciplines, to promote so called “interdisciplinary” or “multidisciplinary,” or “transdisciplinary” work. Most of these programs call out societal ills or other “grand challenges” as a motivation for interdisciplinary work. Here at the University of Minnesota, we have our initiative on Grand Challenges, of which IonE is an immensely proud partner. How can we do this? In collaboration with partners on the front lines of sustainability challenges, academics can set goals that serve as a flags in the sand. Engineers and clinical medical scholars are used to striving toward a functioning prototype, a new drug, or eradication of a disease, and the rest of us can learn from them. We also can update standards for university seed funding. Through grand challenge initiatives or others, many universities incentivize interdisciplinary research with internal grants, inviting applicants to submit ideas built around a team with diverse expertise. We do this at IonE too, but, going forward, we will ask those proposals to describe not just the importance of their work but also how they will solve a grand challenge. We stretch the idea of interdisciplinarity further when teams work toward a shared, societal goal – and are willing to be measured against it. And when we achieve a shared, societal goal, we not only harness the specialized, significant resources of the university to create meaningful impact, we also create a university that can no longer be accused of operating in a bubble, isolated from the concerns of the wider world. So, what do you think? If you’re an academic, could you see yourself working with others toward a shared objective? What if that goal is related to – but not strongly aligned with – your core area or expertise? And if you’re in the private, nonprofit, or government sector, would you join academics if they were working toward specific, tangible outcomes? Leave me a comment here or send me a tweet! Over the last week or so, I’ve been part of an effort to file a comment with the Environmental Protection Agency, criticizing its plans to rescind the Clean Power Plan (CPP). You might know about the CPP. It was a key way that the Obama Administration planned to meet its Paris commitments: to reduce emissions about 30 percent below 2005 levels by 2025. And it was the one of the first actions taken by the EPA to regulate greenhouse gas emissions, something the U.S. Supreme Court mandated with its ruling on Massachusetts vs. EPA. Our comment – which soon will be publicly posted to Regulations.gov – goes on for about 10 single-spaced pages, chock full of research about the observed and future effects of climate change. And the comment covers just the most recent research and changes in the climate that we have seen since the CPP was introduced in 2015 – three of the hottest years on record, catastrophic storms and fires, and redistribution of species worldwide. We are not arguing for the CPP per se, but stress the importance of taking meaningful action, of going forward not backward, because a tipping point is near. And we realize that – at least with respect to current EPA leadership – our comment will probably have little effect. So why write it at all? At least part of the answer has to do with posterity. Posterity is having concern for future generations, about being concerned about what those people will think, how they will live, and how they will reflect on those of us who lived and worked today. You don’t hear much about posterity these days (figure), but you should. It’s part of helping to build a future where people and planet prosper together – the very mission of IonE. Building a better future requires concern for that future: truly caring about a time you may very well not live to see. There won’t always be a receptive audience for the right thing to do in the name of posterity, but it’s crucial to show up regardless, particularly when the stakes are high. In the case of greenhouse gas emissions, our government is ignoring a problem that’s undermining humanity. And as purveyors of knowledge and a best-as-we-can commitment to intellectual honesty, we – the scientific community – cannot let roll-backs in government responsibility go by unremarked. That’s why we write when the direct benefits are unclear: because we are supposed to. Both the EPA comment and the amicus brief are now part of the public record, and I’m grateful to have had a chance to be a part of that record. In standing up for posterity, however, we are also standing up for today. IonE is a what’s called a boundary organization; we work with people both inside and outside of the University – and it is important for our partners and collaborators outside the university to see us share our thoughts and work in the public domain. And although theories about society suffering from information deficit have been debunked (i.e., that explaining science more and better will change hearts and minds), discourse about ideas does shift the social conversation over time. Cultural and structural change – especially change as difficult as transforming our economy – does not happen overnight. Rarely will any scientific paper, analysis, or even relationship with a decision-maker have dramatic and immediate effects. Action does happen – just not on the timeline we, as humans, would like to see. And just like science itself, we stand on the shoulders of those who have come before us, and we make mostly incremental change. We should strive for breakthroughs in all the work we do, but posterity simply asks us to do our best and keep showing up. We do this at IonE. We show up. This is why people like to work here, and this is why our faculty affiliates want to be part of this special place and special idea. I doubt many university scholars include “posterity” in their list of core values. But for me and others at IonE, it is there, even if sometimes hidden from plain sight. This month I’m back from the Natural Capital Project’s annual symposium. A whole crew of IonE folks make the trek to Stanford University each year to give talks, meet collaborators, host workshops and network with ecosystem service practitioners from around the world. I did too. At the symposium, The Nature Conservancy’s Mark Tercek reminded attendees that great science is essential to getting natural capital on the books in every country and company around the world. When we put our best science about natural capital up against other considerations (like profit and cost), it won’t sway every decision – but it will more often than not. My part of the symposium was a panel (with leaders from Stanford, the University of Washington, TNC, and the National Oceanic and Atmospheric Administration) that addressed the role of academic scientists in real-world decision-making – something that has been on my mind a lot lately. I talked about how important it is for scientists to find common ground with the public so that we can earn and keep a space at the table of decision-making, about taking responsibility for finding solutions in our research, and about moving faster, to better match the pace of real-world decisions. All of these things are alive at IonE, and we have plans to grow and expand in each of these areas. Meanwhile, Ellen Anderson, director of IonE’s Energy Transition Lab, was named a “critical collaborator” for 2018 by the Environmental Initiative. In the nomination letter we wrote for Ellen, Fresh Energy’s Michael Noble offered this perspective: “No single public sector leader has had more influence on Minnesota’s success as a clean energy leader than Ellen Anderson.” Wow. This recognition–and other current events in the world– have me thinking about my own motivations, my reason to get out of bed each morning. Different parts of the IonE community have different reasons, but I decided recently that I get up in service to the 10 percent of biodiversity that experts think could be go extinct due to climate change in the next several decades. Ten percent is a relatively conservative estimate, and if our estimates of global biodiversity are right, it amounts to 900,000 species! (And that doesn’t count declines in ecosystem health or other change in biodiversity.) If we are going to craft effective strategies for stemming that loss, we need to know who those species are, why they are sensitive and what corrective actions can be taken. The answers to those questions lie in smarter habitat management, new ideas like managed relocation, and building an economy that incentivizes the natural capital that houses the life on earth. Being in service to those 900,000 is not just about aesthetics and a moral duty to other creatures. It’s about sustaining the life on earth that sustains ourselves. I think that’s a good reason to put my feet on the floor each morning. P.S. I hope you’ll join me at a Minnesota Public Radio event on the evening of April 26 at the Fitzgerald Theatre in St. Paul. MPR’s Climate Cast, hosted by Paul Huttner, will host a live event called “Climate Heroes.” I’ll share the stage with Minnesota climate legend Mark Seeley and US Water Alliance’s Radhika Fox. I can’t wait. I’ve heard people say that March is the snowiest month in Minnesota. It turns out that’s not true – or no longer true now that the climate is changing. So spring – now earlier than it was historically – is truly around the corner. This month I’d like to share some thoughts I recently shared at the annual meeting of the American Association for the Advance of Science, the world’s largest general scientific organization. The AAAS annual meeting is a place where new, cutting-edge research is revealed to the public and where scientific leaders talk about the role of science in society. The ideas in my talk are ideas at the heart of IonE: How do we build an academy that is ready, willing and rewarded for serving the public good? At AAAS, I argued that we need to get academic environmental scientists outside of their traditional modes and mindsets – and I showed how the University of Minnesota is leading that transition. What follows is an adapted version of what I had to say – and, as always, I welcome your thoughts and feedback. Society is experiencing unprecedented environmental change – and we need science to make sense of these changes and help us decide what to do about them. It follows directly from this need that academic scientists have a duty to help society survive, and even thrive, in the face of these profound environmental changes. Despite this broad duty to the common good, the language we – scientists – use to talk about environmental change reveals a lot about how we tend to see the role of science in society. First, we love to emphasize that science delivers facts. That’s absolutely true: After all, CO2 is a greenhouse gas. But that’s just a fact. But a lot of what the world needs from science – and a lot of what science can and should deliver – isn’t about simple facts. We also focus on describing impacts: the bad things that happen when the environment changes. Our journals are full of talk about vulnerability, as a measure of risk yet to come. And we prioritize conservation – that is, keeping things as they were. These words emphasize the negative and revere the past. But now think about some other words: prosperity, freedom, stewardship, and equity. These are things that voters, policy-makers, and students want – and we need science to help us get there. When scientists work toward these things – when we put these kinds of words at the center of our work – we share core values with the public and help create a positive future. For example, scientists can measure the risk of climate change to biodiversity. Experts expect that 900,000 species could go extinct this century due to climate change. But the methods that estimate risk can also be used to make recommendations about smart climate change adaptation, such as landscapes that promote species migration or urban environments that are climate resilient and embrace biodiversity (like this group and this map). In principle, there’s nothing preventing academics in the environmental sciences from engaging in forward-looking research – research that tells us not only how the world is but what it can and should be. Some fields – such as engineering and agronomy – already do. But many fields are focused more on assessment than solutions. We can do better. At the Institute on the Environment, we believe there are some essential ingredients to building an academia that better serves the common good. As a mission-driven, interdisciplinary organization focused on innovation in research and leadership, we take our duty very seriously – to the University of Minnesota, to our fellow Minnesotans, and to the world. We need to put people in the center of research about the environment. Scientists might think they study biophysical processes, but it’s people – with values and beliefs – who make decisions about the environment. At IonE, we made this orientation an explicit part of our mission: We lead the way toward a future in which people and planet prosper together. We should embrace – not fear – public scrutiny. At IonE, we are working to seed public engagement earlier in to the research process, incentivizing co-creation over outreach after the fact (like this recent work with the Minnesota state government). We have to provide training about listening to and working with stakeholders. Some of the folks that need the most training (and for whom the least support is available) are our most esteemed researchers. At IonE, we work to lift up our whole community – from faculty fellows to undergraduate students – through workshops and peer mentoring. We need boundary organizations within academia. It takes time and talent to get outside the university, and we need to make it easier for our best researchers to do that. One way we make these connections at IonE is through convenings put practitioners in direct collaboration with researchers. I’ll be sticking to these six points in other talks this year – and leading by example is one of the most important ways we create a different way of doing. In honor of the season of rebirth (spring! ), we are working toward continual rebirth of the academy itself. Onward! Want to learn more? You can read more about ideas related to the six points above in this paper led by IonE’s Bonnie Keeler and in a series of three blogsthat colleagues and I wrote for Nature magazine a few years ago. Other than kid pick-up, the training plan for my next half marathon and what the family is going to have for dinner tonight, my interest and attention is divided among a few different topics right now. Congrats to Kate Brauman (one of our IonE lead scientists) and Steve Polasky (an IonE Fellow), who are co-authors on a new paper, published in Science, which advances our definition and understanding of ecosystem services and the value of nature to people to include indigenous and local perspectives, and a wider range non-material benefits. This paper is just one more example of the importance of our institute’s mission: to lead the way to a future where people and planet prosper together. The paper grew out of the Intergovernmental Platform on Biodiversity and Ecosystem Services (IPBES). And just this past Friday, IonE hosted another Sustainability Education Summit, an outgrowth of the IonE Educators program. 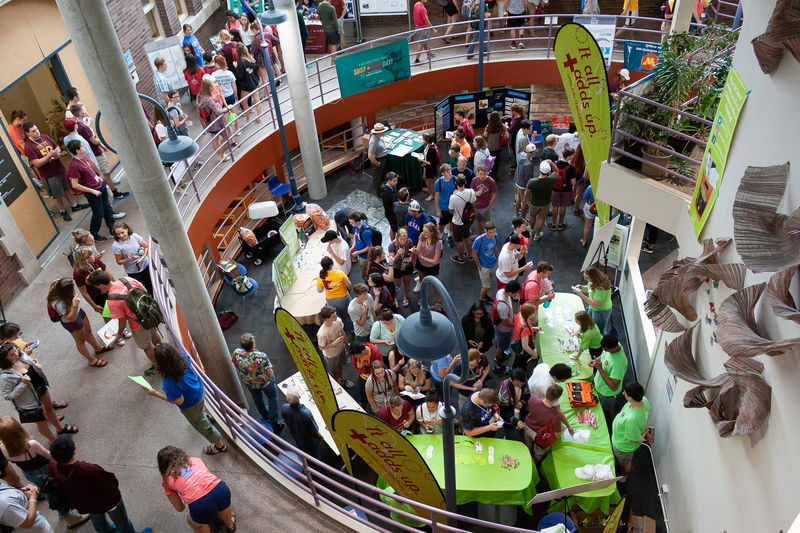 The summits include participants from a range of disciplines and are digitally co-hosted on all five UMN campuses, which allows people to connect widely and share best practices in teaching and innovation in sustainability. Those of you who have direct connections to the University of Minnesota may know that we’ve embarked on an ambitious capital campaign. For my part – for IonE’s part – I’ve been working to make fundraising a priority for my time and attention each week. Jan Gerstenberger and I are working together to make meaningful connections with more individuals who share our mission and vision. Individual philanthropy is a key ingredient of fundraising in higher education, but it’s not something IonE has prioritized in past. The great news is that we had growing success with individual giving at the end of 2017 – and I’m so proud that IonE staff and affiliates were among the contributors. Thank you! I’m also thinking a lot about strategy. In short: Now that we have celebrated turning 10, we have an opportunity to define – together – what our next decade will hold. I’m confident that IonE has the right ingredients for success in our culture and values. We also have the right people. I also recognize that our community has grown and changed in the past 10 years, as has the world – and we have an opportunity to be clearer and more concise about our goals. Right now I’m strongly influenced by a Harvard Business Review article that asks: “Can you say what your strategy is?” It argues that everyone in an organization should be explain its strategy in 35 words or less. I want us to get there. We will get there. This past week I’ve been helping manage a paper arising from a former PhD student that was accepted by the Proceedings of the National Academy of Sciences. It’s a cool paper: We studied thousands of butterflies collected in the 1980s and compared them to thousands we collected in the late 2000s, using genomic techniques to see how climate change has affected a zone of interbreeding between two related species. We found that the zone where the two species hybridize has moved: It’s shifting north. And the amount the hybrid zone has moved corresponds to the amount that the climate has warmed. I’m also teaching this term with Rebecca Montgomery (another one of our IonE Fellows) and Leslie Brandt, a weekly seminar about climate change adaptation for natural resources. We have about 30 participants and will be working our way through species vulnerability assessments, to climate projection data, to economic assessment of impacts, and ways of building new management strategies that account for climate change. I’m excited about it. Right now, I’m reading about Greek philosophy and the origin of the academy – related to some thinking I’m doing about how IonE is, at its heart, a modern version of the power of inquiry and discussion to bring about wisdom. Feeling smarter as a result. I’m also still feeling frustrated about last week’s news that tariffs will be added to imported solar panels. The decision is expected to increase solar prices, just as solar is beginning to be price-competitive with coal and natural gas. Think: fewer solar projects, fewer solar jobs. And the U.S. needs, desperately, to increase solar energy production to save ourselves and our future. Would our government put tariffs on other things Americans really need? Life-saving drugs? Medical equipment? Now with very tired fingers, that’s enough for one post! Please let me know what you think of this blog – and I’ll give it another shot in the coming weeks. P.S. Have you ever wondered: Why sign off with planetary prosperity? It reflects our mission statement, and it’s truly what I want. I want to be happy and to do well, and I want other living things to prosper too.